Heat oven to 350°F. Spray 3 (8-inch) round cake pans with cooking spray. In large bowl, beat cake mix, water, oil and eggs with electric mixer on low speed 30 seconds, then on medium speed 2 minutes, scraping bowl occasionally. Divide batter evenly among 6 small bowls, about 1 1/3 cups each. Using food colors, tint batter in 1 bowl blue, 1 bowl red, 1 bowl green, 1 bowl yellow, 1 bowl orange (using red and yellow) and 1 bowl purple (using blue and red). Refrigerate 3 colors of batter until ready to bake. Pour remaining 3 colors of batter into cake pans. Bake 18 to 20 minutes or until cake springs back when touched lightly in center and begins to pull away from side of pan. Cool 10 minutes. Remove from pans to cooling racks; cool completely. Wash cake pans. Bake and cool remaining 3 cake layers as directed. In large bowl, beat shortening and butter with electric mixer on medium speed until light yellow. On low speed, gradually beat in powdered sugar. Beat in vanilla. Add milk, 1 tablespoon at a time, beating until frosting is smooth. Beat on high speed until light and fluffy. Trim rounded tops off cakes to level, if needed. On serving plate, place purple cake layer. Spread with frosting to within 1/4 inch of edge. Repeat with blue, green, yellow, orange and red cake layers. Spread light coat of frosting on top and side of cake to seal in crumbs, then frost with remaining frosting. Cake batter is stable enough to wait in the fridge till the first three layers are baked. Be sure to rinse the pans in cool water and dry them well before scraping the rest of the batters into the pans. If you only have two 8-inch pans, it’s okay to bake the layers in three batches. Use a kitchen scale to weigh out the batter for each layer, so they bake up evenly. Make this a party cake and switch up the colored layers as requested by the birthday girl or boy. For guaranteed easy unmolding, line each pan with baking parchment. Set one of the pans on the paper and trace a circle around the base with the tip of a sharp paring knife to create a round that fits inside the pan; repeat to make enough for all the layers. Using half shortening and half butter for the buttercream frosting ensures that it will stay firm enough at room temperature. Make it ahead and chill it for a while to firm it up before assembling the layers. If you only have two 8-inch cake pans, bake the cakes in three batches instead. 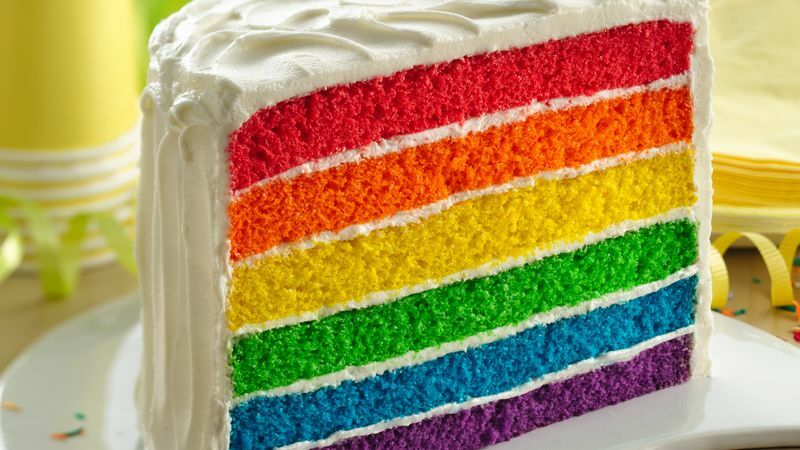 As the classic children’s song says, “Red, Orange, Yellow, Green, Blue, Purple Make the Rainbow Bright.” All the colors of that fabulous rainbow come together in a super-celebratory rainbow layer cake that’s perfect for any occasion. If you’ve been wondering how to make a rainbow cake, Betty is ready to walk you through all the steps. Rely on her Betty Crocker Super Moist vanilla cake mix and Betty Crocker classic gel food colors to streamline the baking process. Get ready for some major “oohs” and “aaahs” when you cut into this full-spectrum masterpiece. And now that you’ve got rainbow cake mix mastered, you can find traditional favorites, quick-and-easy shortcuts and fun new twists in Betty’s Best Layer Cakes recipe collection.